I am enjoying a bit of time in the quilt studio from time to time. It doesn't seem like I get nearly as much time there as I'd like, but when I get the chance... I sure do enjoy it! 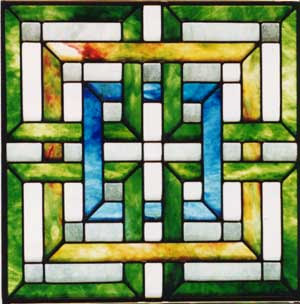 When I saw this image of a stained glass window, I knew I had to try it in fabric. So I played a bit with the drawing to explore some other color options. You'd think it would be a simple exercise to put this one together in no time flat? But I am pleased with how the pieced top turned out! Hand dyed cottons and un-dyed white.